A potent combination of glucosamine (from hydrochloride or HCl), fortified with MSM and Hyaluronic Acid, on a palatable dextrose base, providing great value joint and mobility support for all horses and ponies. 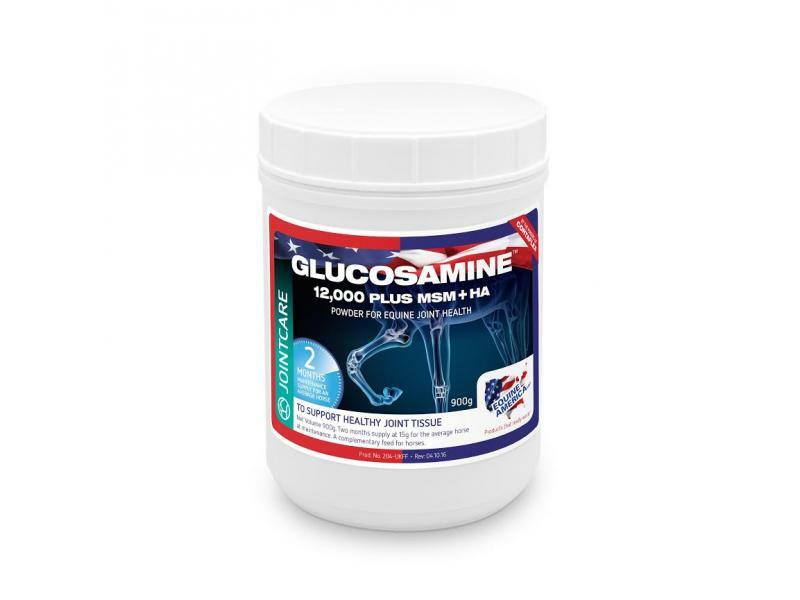 Glucosamine HCl 12,000 provides those key compounds, including 12 g glucosamine per 30 g loading dose, as well as key nutrients Hyaluronic Acid and MSM, to provide nutritional support for both cartilage repair and to help maintain synovial fluid which lubricates and nourishes the joint. NOTE: "Glucosamine 12,000 plus MSM & HA" is replacing "Glucosamine 10,000 plus MSM, Turmeric & HA"
Contains 10,000 mg of 99% pure Glucosamine Sulphate plus 1650mg of MSM per 30 gram loading serving. Feed 30 grams for 30 days and then maintain on 15 grams. Below are some recent questions we've received regarding Equine America Glucosamine Plus, including answers from our team. I notice quite a few products have HA. I am looking at the Glucosamine plus MSM + HA (but it's in a few products). I can't find an explanation for what this HA is - can you advise? Hyaluronic Acid (HA) is found naturally in the synovial fluid of the joints. It helps to lubricate the joints and so is added to many joint supplements in the hope that it will soothe stiffness and increase mobility. I am not sure how much of it actually gets into the joints when given orally but many people do report good results with supplements of this type. How many scoops per day for a 500kg horse..
How many of the 25ml scoops does my 500kg horse need per day? The measure enclosed in this supplement is a 15g measure. A standard 500 kg horse requires 30g (2 scoops) for the first 30 days then a maintenance dose of 15g (1 scoop) thereafter. Would this product help my orphan foal with upward fixation of the patella (stifle lock ) due to loose tendons he's 4 months ??? Desperate for any help ! Locking stifles are not uncommon in young horses. Most often it is due to weak quadriceps muscles. Some horses will grow out of it as they get older and stronger. Others require strengthening of the muscles around the stifle by walking up hills and over poles etc. Occasionally surgery is required. You should control any pain or associated swelling with non-steroidals (metacam would be best in a foal). The stifle joint is not likely to suffer too much damage but feeding a joint supplement such as Equine America won't do any harm and could help maintain a healthy joint surface. However it will not do anything to cure or prevent the locking stifle. Is this safe to feed t the loading rate permanently? Yes this can be done. Normally the amount of extra benefit you might get does not warrant the extra cost, so the reduced dose is done more for financial reasons. It is safe to continue with the loading dose life-long if it is helping. Can you tell me if the ingredients are derived from animal sources please or is this vegetarian? The company does not state where the glucosamine comes from, but it is very unlikely to be vegetarian. That would make it more difficult to extract and make into the finished product and they would almost certainly state it was vegetarian as a sales promotion if indeed that were the case. Usually it comes from shellfish and the like. 1) Is the Glucosamine: glucosamine hydrochloride or glucosamine sulphate please? 2) What is the purity value of the glucosamine? Glucosamine sulphate is used in this product. The purity value is not stated. Given that this is such a well known brand I would expect the purity to be high, though it might well vary slightly from batch to batch. Is this suitable for pregnant mares? She has been lined so will have a foal april 16, is this product suitable for pregnancy, full term? if not, what is? There is no reason to stop using this product during late pregnancy or while lactating after foaling. You can continue to give it. I see that for manufacturing reasons the glucosamine 10,000 has been reduced to 5,000. Is this really as effective? My 20 and 25 year old horses are currently on the higher dose. The manufacturers have advised that those previously using the Glucosamine 10,000 product for joint health maintenance in leisure horses should be able to switch to Glucosamine 5,000 at the recommended dose and see no decline in performance. Can you advise how much to feed a 400kg cob. Trying to work out how long the tub would last. At a standard dose rate (30g per day) one tub will last one month.